The Miners broke convincingly above the 200 MA on Tuesday. Tuesday was day 23 for the daily Miner cycle. The new high on day 23 assures us of a right translated daily cycle formation. However, 23 days places the Miners in their timing band for a daily cycle decline. 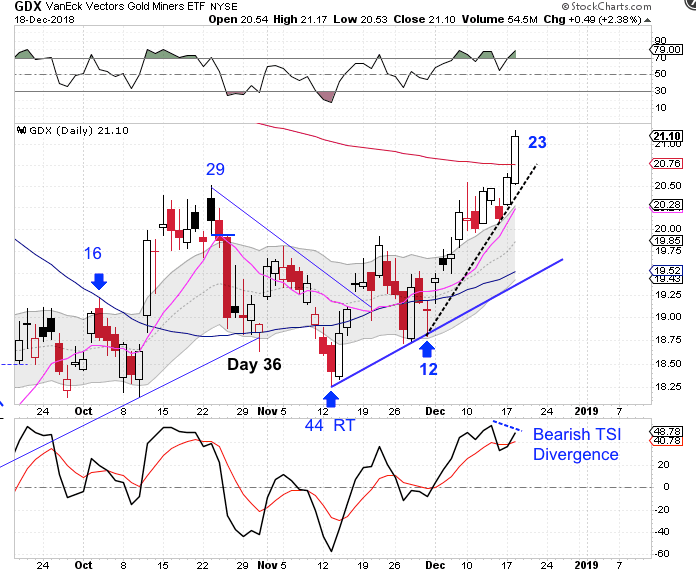 There is a bearish divergence that is developing on the True Strength Indicator that we normally see as a cycle nears its peak. The large 226 million Selling on Strength is another indicator that the daily cycle is near its peak. Therefore we are watching for a swing high accompanied by a break below the accelerated daily cycle trend line to signal the daily cycle decline.